Upon reflection, I realize that the principles behind these statements are not really the problem. I truly don’t want my child to throw fits in public, ignore me when sitting right next to me, or lock me out of their world and hide in their music. We should and must have principles outlining what we will and will not allow our children to do; how we want to raise them and what kind of relationship we want with them. It’s not only important but essential to have Biblical standards for raising our children. I realize then that the problem with these statements is my pride. It’s in the phrase “ MY child will NEVER.” What I’m really saying is, I am a better parent than the one I’m watching before me. I know how to do it better. I’ll get it right. I’m going to be an exceptional mother and the proof will show in my children. Besides the prideful heart that lies behind these statements is an ugly judgement that I’m making. It’s one thing to make a wise judgement based on what is good and right as revealed in God’s word. This is something that we are called and commanded by scripture to do. The problem lies in judging these mothers’ motives, intents, heart…something I cannot see and must leave to God alone. I have no idea what has taken place in the minutes leading up to the moments I’ve witnessed. What kind of week has the mother had, leading her to not respond as quickly and confidently as she could have with her out of control toddler? What thoughts is the mother battling as she sits in silence next to her child? What arguments are the parents thankful to be avoiding as the child sits with them, though not in conversation with them? I know nothing of their experiences, and should be careful not to pass judgement on the efforts or success of the mothers before me. What’s worse, after I have passed this judgement, I elevate myself, feeling as though I am so much better and will never repeat those mistakes. How foolish of me! There are times when we will observe parenting styles that are not only unwise, but objectively sinful. Of course, the parents’ motives/intents of the heart in no way justify the behaviour. But even then, do I lift my prideful nose and conclude that I am a “greater” parent…or do I turn to God for grace to do what is right so that I do not repeat the mistakes I see before me? I have to remind myself that any success I have with my child is because of God. 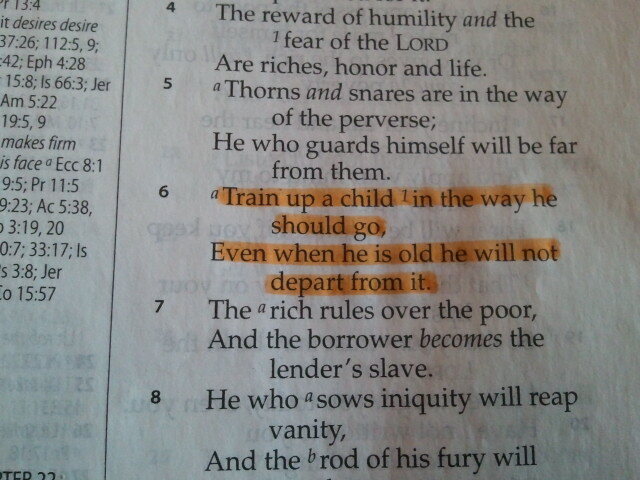 He is the one who, through His word, will teach me how to parent my children. He is the one who provides me with the principles I need to teach her. He provides me with guidelines for discipline, punishment and reward. He requires me to be faithful with the role He has given me, and any success I have in her upbringing will be a result of His wisdom and faithfulness. His teachings, His guidelines, His Spirit empowering me, for His glory. And when I too display poor parenting skills, whether in private or in public (I’m sure you will catch me on several occassions) He will faithfully convict, correct and restore me. There’s absolutely no room left for my pride. So I ask myself these questions: Have I looked down on others condescendingly, rather than lifting them up in prayer and asking that God change and mould them, bringing about their good for His glory? Are there any areas where I am experiencing success, and am tempted to take the credit? Have I compared my accomplishments to others, felt slightly superior, and then taken the glory for those accomplishments? My answer to all of these is a shameful yes. Thank God for His patience as we are slowly changed into the image of His Son!